Purchased by St. Michael the Archangel Parish in 2009 as a "temporary" instrument until a larger, permanent organ could be commissioned, this modest 12-stop tracker organ serves admirably in our new church. The organ was built in 1971 by John Brombaugh & Associates for St. James Episcopal Church in Columbus, Ohio. Besides being one of the first organs of a pioneer of late-20th century historically-informed organ building, it enjoys an even more remarkable pedigree in that several of the world&apos;s great organ builders that followed in Brombaugh&apos;s footsteps have a had a hand in improving the instrument over its 40-year life. Early additions were made by Taylor & Boody Organbuilders. 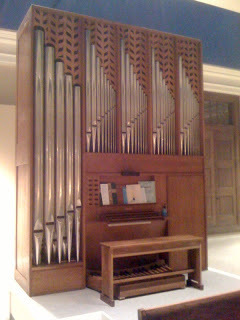 When the organ was relocated in June 2009 by Paul Fritts & Co. from Ohio, Bruce Shull made tonal alterations (with John Brombaugh&apos;s permission) using new lead pipes from the shops of Paul Fritts and Martin Pasi. The organ was one of the first in modern times to be tuned in the historical Werkmeister III temperament, in which it remains today.